Despite the more than 1 million companies throughout Canada, SoOPak has managed a true achievement: landing a spot on the Profit 500 list. This list is of the fastest-growing companies in the country and is the place to look for up-and-coming businesses as well as the entrepreneurs that lead them. In case the name of the Profit 500 list isn’t enough to convey exactly what it means, a quick explanation can help. The companies on the list are the 500 Canadian businesses that are currently growing the fastest. Any business can be nominated or apply to be included on the list, as long as the business has grown by at least 50 percent within the previous five years. SoOPak has clearly met this requirement and made its way onto the Profit 500 list. Simply having 50 percent profit growth within the last five years isn’t enough to make the list, however, and that is part of what makes SoOPak’s achievement even more prestigious. It has proven that it is truly one of the top companies in Canada as well as a business to keep an eye on in the future. 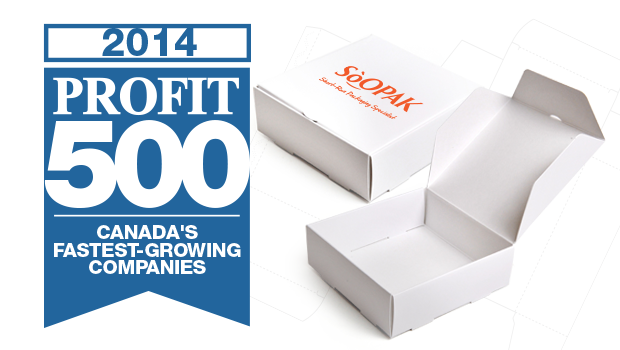 SoOPak is clearly a Canadian company due to its presence on the Profit 500 list. This particular company is a packaging firm and focuses on providing a range of custom packaging options for various types of products. It is able to package items for many different types of industries, including automotive, food, cosmetics, personal care, candles, beverages, clothing, soap, electronics, and more. SoOPak works closely with its clients and is able to fulfill orders both for standard box and packaging types as well as custom ones. What truly sets SoOPak apart from the competition, however, is its specialization in short-run orders. This means that it will take orders of nearly any size, even if it is just for several hundred boxes. This has put it at the top of the list of packaging firms that deal with smaller businesses, as startups and small companies don’t usually have the resources necessary to place large packaging orders. As a member of the Profit 500 list, SoOPak entrepreneurs and leaders will be able to attend the Profit 500 CEO Summit, a private event that is considered the most exclusive in the country. There will even be a profile of the company in a special issue of Canadian Business, so those around the country can learn about the company’s achievements. After being part of Profit 500, SoOPak will have even more opportunities to excel and continue its revenue growth. These come via the summit mentioned above in addition to discounts to various Profit events for further enrichment. There is also a great deal of publicity associated with being a part of the list. In addition to the business profile, SoOPak will also receive marketing and PR support from Profit as well as access to the Profit 500 official logo, letting everyone know about its truly impressive achievement.